When we first brought our baby home, we were excited to introduce her to our 2 year old dog. After a year, our toddler and dog are the best of friends and great playmates for each other. Introducing the new baby to the family dog requires patience but it can be done. It definitely is more beneficial if your fur baby is properly trained and listens to commands – this makes for a smoother transition and for more control over the situation. Change is always stressful so try to make this time easier by getting your dog used to the fact that there will be a little human around. Let them smell all baby related items, like diapers and baby clothes, bottles. If you intend to allow the dog into the baby’s room, let them sniff the crib, the toys, blankets, car seat, blankets, swaddles, swings, bouncers and other baby paraphernalia that will be lying around the house. This way the barrage of baby items doesn’t dumbfound your dog. When we first brought our baby home, we let our dog sniff her and her swaddle. He was curious and interested but don’t worry if your dog isn’t interested or is cautious. If they are curious but excited, temper their energy. Asking them to sit while you let them smell baby slowly. Remain calm and maintain a gentle, relaxed energy as dogs can definitely sense when you’re tense or anxious. If they are uninterested or cautious, leave them be. Don’t force the introduction or rush it, let it happen on its own when the dog feels relaxed and at ease. You want to make this experience a pleasant one for both the dog and you and, of course, baby. Don’t be discouraged if your baby and dog don’t do well with each other. Sometimes it takes time, not all dogs and babies have the right temperament for each other and it may take longer for them to get used to each other. Use your best judgment and be patient. Depending on your comfort level of how involved you want the dog to be with baby, encourage interaction but also ensure boundaries are established. Your dog still needs to be able to listen and obey your commands when you give them while they are around baby. Safety is of upmost importance! For example, we did not want our dog to lick our newborn on her face so we had to constantly reinforce that behavior to make sure he understood that it isn’t acceptable. Consistency is key. It goes without saying: always make sure any interaction between dog and baby is supervised. NEVER leave a baby unattended with a dog, no matter how good the dog is with kids. As your baby gets older and more interactive, it’s important that they learn how to be gentle with your dog. Similarly if your dog wants to play with your child, teach them to be gentle and less rambunctious than they would play with you. 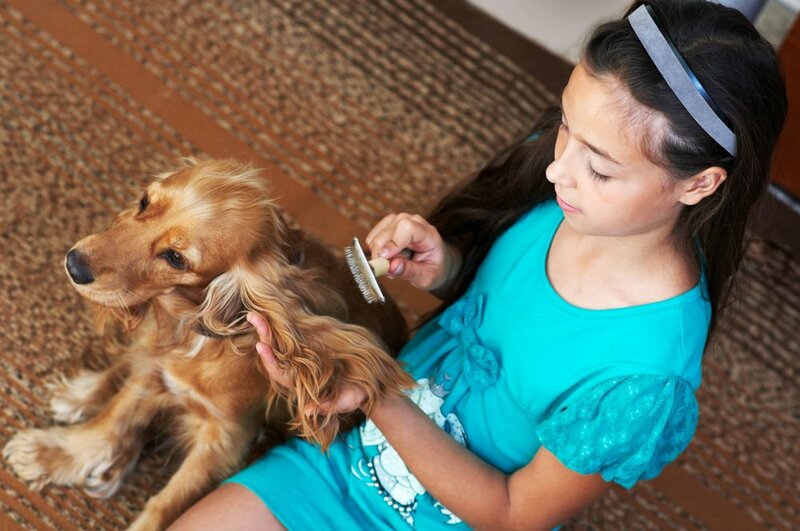 Teach them to pet your dog gently by demonstrating. Use a soft, gentle voice while petting the dog gently. Allow them to participate in basic pet care like brushing or feeding. Use your discretion if your dog is sensitive or has issues with food guarding. Hopefully these tips are helpful as you help build a wonderful friendship between your dog and your baby. We love watching our dog and toddler interact and are constantly amazed at how good they are with each other. She now has a built in playmate and furry best friend for life!